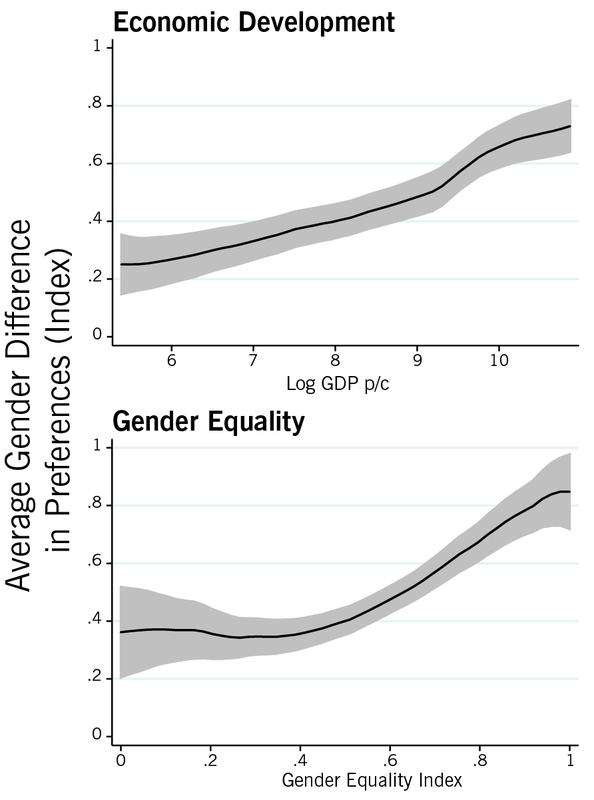 Higher levels of economic development and gender equality are associated with larger gender differences in economic preferences across countries, according to a new study published in Science. The analysis by Armin Falk (briq and University of Bonn) and Johannes Hermle (University of California, Berkeley) is based on a globally representative dataset on risk and time preferences, positive and negative reciprocity, altruism, and trust. Previous research has shown that gender differences in these fundamental economic preferences are important in explaining gender differences in economic outcomes, such as for occupational choice, financial investment, or educational decisions, among many others. However, gaps remain in understanding the sources of gender differences in preferences and their variation. Falk and Hermle contrasted two hypotheses that make opposite predictions. The “social role hypothesis” posits that the attenuation of gender-specific social roles in more developed and gender-egalitarian countries will alleviate differences in preferences between women and men. In contrast, the “resource hypothesis” is based on the notion that greater availability of material and social resources creates the scope for gender-specific ambitions and desires, potentially leading to an expansion of gender differences in more developed and gender-egalitarian countries. To test these competing hypotheses, the authors used the Global Preferences Survey. Initiated by Armin Falk, this survey contains data on experimentally validated measures of willingness to take risks, patience, altruism, positive and negative reciprocity, and trust for 80,000 individuals in 76 representative country samples. The dataset includes all continents and a broad range of cultures and economic development levels, representing about 90% of both the world population and global income. 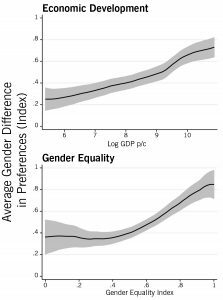 The data analysis provides evidence in favor of the resource hypothesis: Gender differences were found to be strongly positively associated with economic development as well as gender equality. These relationships held for each preference separately as well as for a summary index of differences in all preferences jointly (see figure). The findings remained robust in several validation tests, such as accounting for potential culture-specific survey response behavior. “Our results highlight that a more gender-egalitarian distribution of material and social resources allows women and men to independently express gender-specific preferences,” says Armin Falk. The authors stress, however, that their findings do not rule out an influence of gender-specific roles as cross-culturally universal drivers of gender differences in preferences, nor do they preclude a role for biological or evolutionary determinants.